When Chris Weidman served up an upset special on former UFC middleweight champion Anderson Silva, reigning UFC light heavyweight king Jon Jones (pictured) immediately catapulted atop MMA’s unofficial ‘Baddest Fighter on the Planet’ list. In reality, it’s a spot many pundits believed Jones had overtaken well before Silva lost. Putting “The Spider’s” UFC record 10 successful title defenses aside – in one fight, right here and now, most believe a 26-year-old Jones would have handled a 38-year-old Silva. It’s no knock on Silva’s credentials, but simply one of the harshest realities in sports – a superstar athlete just sniffing the prime of his career typically has the edge over a superstar athlete in the twilight of his. Whether it be the been-there-done-that factor, I-want-what-you’ve-got mentality, or a combination of the two, Jones believes his time has arrived, while the ship may have already sailed for Silva. “Anderson Silva has been in the game for a long time and maybe he’s at the end of his career, but I just turned 26 years old – no injuries – I am at the very beginning of my career,” Jones expressed during Tuesday’s UFC 165 conference call. “We are at completely different stages, as far as drive and motivation. 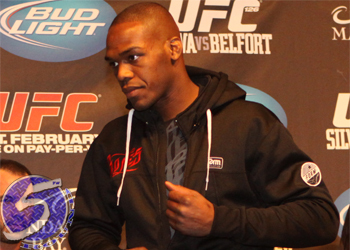 Jones is mapping out his own course towards greatness, and he’s hellbent on his ship landing on G.O.A.T. island when it’s all said and done. So, just because Silva took his eyes off the prize doesn’t mean the same thing will happen to him. Jones looks set the UFC record with six consecutive light heavyweight title defenses when he fights Alexander Gustafsson on September 21. Five more successful 205-pound title defenses after UFC 165 and “Bones” will be the most decorated champion in Octagon history years before he celebrates the big 3-0.